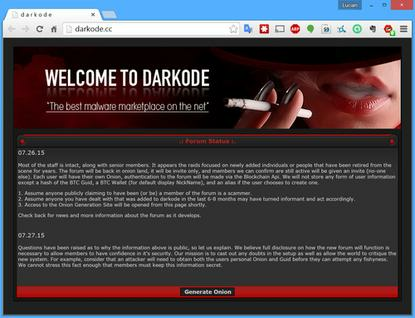 On July 15, the U.S. Department of Justice announced that the Darkode hacking forum where cybercriminals had gathered to exchange services and tools for years, was dismantled following an operation that involved agencies in 20 countries. Seventy suspected Darkode members from many countries were searched, arrested or charged after the FBI infiltrated the forum's invitation-only membership and gathered evidence. However, the forum's most recent administrator, a hacker known online a Sp3cial1st, or Sp3c, was absent from the list of names and aliases released by the DOJ, prompting speculation that he's still at large. That belief was strengthened in recent days by a message about the forum's future that appears to come from the hacker. According to a U.K. cybercrime researcher who uses the online identity MalwareTech, Sp3cial1st announced his plan to restore the forum. The announcement was made through the Jabber instant messaging account that Sp3cial1st has used for many years, so it's unlikely to be fake, MalwareTech said via email. Earlier today, the website darkode.cc contained a message, supposedly from Sp3cial1st, that outlined the plan in more detail. "Most of the staff is intact, along with senior members," the message read. "It appears the raids focused on newly added individuals or people that have been retired from the scene for years. The forum will be back in onion land, it will be invite only, and members we can confirm are still active will be given an invite (no-one else)." The onion land is a reference to the Tor anonymity network, suggesting that the website will operate inside the Tor network as a hidden service. Moreover, the plan is for members to have separate .onion URLs for accessing Darkode and to authenticate with their Bitcoin wallet IDs via the Blockchain API. No other user information will be stored except for the online aliases of members who wish to create them, Sp3cial1st said. Otherwise, Bitcoin wallet IDs will be used as default nicknames. The new security measures are no surprise given that Darkode had a "massive problem with people using hacked accounts to leak information to law enforcement and journalists as well as scam users," MalwareTech said in a blog post. "Ironically even the Darkode administrators were compromised at one point after one of them had reused his password on another forum, which had its database leaked a few weeks prior."